Epidemiologic data suggest that individuals at all stages of CKD have a higher risk of developing cognitive disorders and dementia. This risk is generally explained by the high prevalence of both symptomatic and subclinical ischemic cerebrovascular lesions. 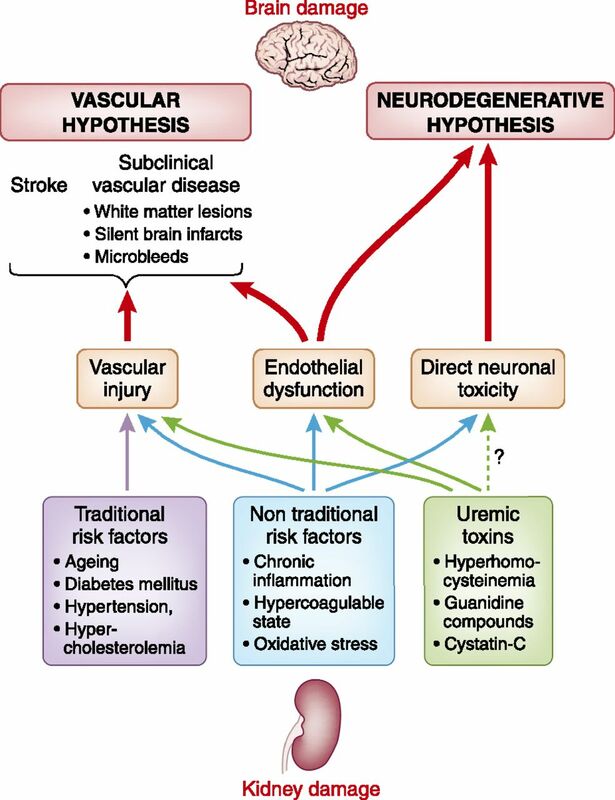 However, other potential mechanisms, including direct neuronal injury by uremic toxins, could also be involved, especially in the absence of obvious cerebrovascular disease. We discuss the prevalence and characteristics of cognitive disorders and dementia in patients with CKD, brain imaging findings, and traditional and nontraditional risk factors. Understanding the pathophysiologic interactions between renal impairment and brain function is important in order to minimize the risk for future cognitive impairment. CKD is a substantial public health problem. On the basis of the French national renal data system, it has been estimated that between 1.75 and 2.5 million people in France have CKD1 and that nearly 40,000 of the latter are undergoing dialysis. In the United States, similar results have been observed: Almost 8% of the population has CKD and 571,000 patients receive treatment for ESRD.2 Although the incidence of CKD is increasing in all age groups, this is particularly true in the elderly.3 Older adults are at a greater risk of developing cognitive disorders and dementia, and a major determinant of the quality of life in the elderly is the level of cognitive function.4 Recent data in this regard suggest that individuals at all stages of CKD may have a higher risk of developing dementia and cognitive impairment than those without CKD.5–7 Given the increase in life expectancy and the aging of the population in industrialized countries, the cognitive disorder burden associated with CKD is expected to worsen. Another important limitation in the interpretation of study data concerns study design, which differs from one study to the other. Some investigators did not report the proportion of nonevaluated patients or provide information on confounding factors, such as sociocultural demographic characteristics, the presence of depressive syndrome, vascular risk factors, and prior cerebrovascular events (such as stroke). Lastly, most of the cognitive tests were administered during a hemodialysis session. Recently, Murray et al. showed that global cognitive function varies significantly over the course of the dialysis session; performance is worst during the session itself and best shortly before the session or on the day after.18 In patients undergoing peritoneal dialysis, the few available data suggest that the prevalence of cognitive impairment might be lower than in hemodialysis patients.19,20 However, this apparent discrepancy may reflect selection bias (because the dialysis procedure will depend on the patients’ characteristics and thus cognitive function before the introduction of dialysis21) rather than the procedure’s characteristics per se. Cognitive impairment in CKD is not limited to patients with stage 5 CKD. Several cross-sectional studies have suggested its occurrence in earlier stages of kidney disease (Table 2). Thus, estimated GFR (eGFR) was inversely related to global performance in global cognitive function tests.6,22,23 Yaffe et al. confirmed this observation by applying a more detailed battery of neuropsychological tests.24 They reported that an inverse relation between eGFR and global cognitive function was observed for most cognitive domains, but the pattern of cognitive impairment differed from one CKD subgroup to another. Patients with advanced CKD (defined as eGFR<30 ml/min per 1.73 m2) were more likely to have cognitive impairment as revealed by tests evaluating global cognition, naming, attention, executive function, and delayed memory, but not tests assessing fluency and immediate memory, compared with patients with mild or moderate CKD (defined as an eGFR 45–59 ml/min per 1.73 m2). However, two other studies failed to show an association between CKD at baseline and the risk for cognitive decline.29,30 In the first, a prospective, cohort study of 5529 healthy older men, Slinin et al. found an independent association between mild to moderate reductions in kidney function and executive function at baseline but not at the end of the follow-up period.30 Recently, data from the 3C population-based cohort study, which included 7839 patients older than age 65 with 7 years of follow-up and baseline eGFR<60 ml/min per 1.73 m2, were not associated with an increased risk for incident dementia or cognitive decline.29 However, in this latter study, the percentage of participants with CKD was relatively low (12% with a baseline eGFR<60 ml/min per 1.73 m2). Furthermore, the patients had a relatively low cardiovascular risk profile, in line with the low prevalence of CKD. This precludes generalization of the study findings to patient populations with more advanced CKD. Subclinical brain lesions in CKD patients. (A) Axial fluid-attenuated inversion recovery magnetic resonance image showing silent brain lacunar infarct (arrow). (B) Axial gradient-echo magnetic resonance imaging sequence showing multiple microbleeds (small foci of hypointensity, arrows) located in the right cerebral hemisphere. 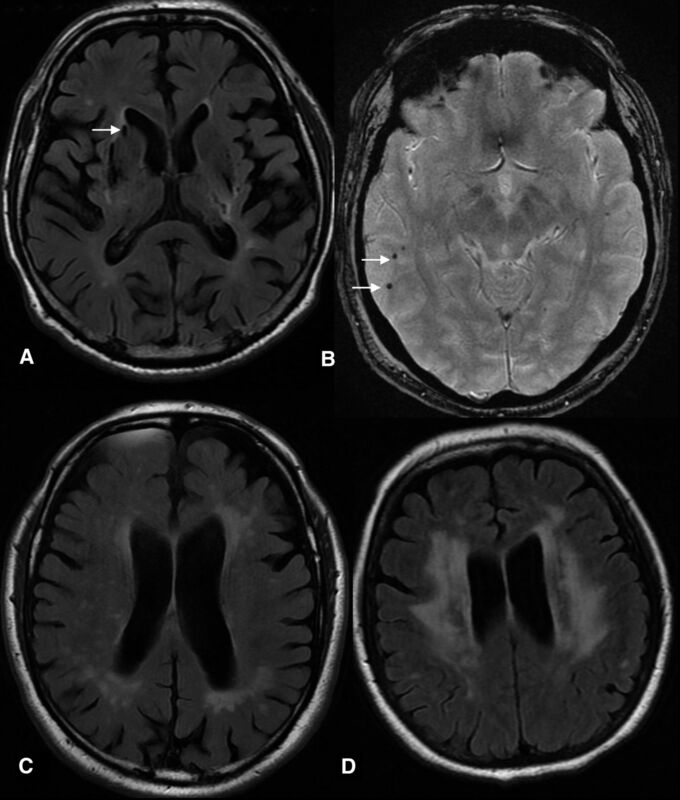 Moderate (C) and severe (D) white-matter lesions in the centrum ovale. Likewise, the prevalence of WMLs is high (up to 70%) in both CKD patients and stroke patients.9,41,42 This is not surprising, given that WMLs are thought to be symptomatic of a progressive, irreversible process that follows on from arteriolosclerosis.43 Most cross-sectional, population-based studies show a strong association between eGFR on one hand and white matter volume and WMLs on the other.44–46 Only Martinez-Vea et al. failed to report a statistically significant relationship between vascular nephropathy and WMLs in a multivariate analysis.47 This absence suggests that the elevated number of WMLs in CKD patients is a marker of systemic vascular disease. As with SBIs, WMLs are predictors of an increased incidence of stroke, dementia, and death.48 Other markers strongly associated with cerebral small vessel disease (microbleeds or microhemorrages) have been studied less extensively. Figure 2 presents the possible causes of cognitive impairment in patients with CKD. The brain and the kidneys have many common anatomic and vasoregulatory features; they are low resistance end organs exposed to high-volume blood flow and thus are susceptible to vascular damage.55 Hence, impaired cerebral hemodynamics, as evaluated by transcranial Doppler ultrasonography, may reveal interesting information on the association between altered cerebrovascular hemodynamics and cognitive impairment.56 Indeed, previous transcranial Doppler studies show a positive correlation between hemodynamic impairment and cognitive impairment—suggesting that microvascular damage contributes to the cognitive changes observed in the early stages of dementia.57,58 Additionally, the prevalence of traditional vascular risk factors, such as arterial hypertension, is higher in patients with CKD than in the general population.2 This might explain the association between CKD and cerebrovascular disease because the latter plays the largest role in the pathogenesis of cognitive impairment in CKD patients. Schematic representation of potential causes of cognitive impairment in patients with CKD. It has been suggested that angiotensin-converting enzyme inhibitors might have deleterious effects on cognition (because they prevent angiotensin-converting enzyme–mediated conversion of Aβ42 into Aβ40, which is less amyloidogenic and less toxic), whereas angiotensin AT1-receptor blockers might exert a protective effect on cognition due to their activation of AT2 and AT4 receptors. Moreover, the accumulation of uremic toxins may cause cerebral endothelial dysfunction and contribute to cognitive disorders in CKD.78 Various uremic toxins have been implicated in the pathogenesis of cognitive impairment.79 DeDeyn et al. reported that cerebrospinal fluid and brain levels of some guanidine compounds, such as creatinine, guanidine, guanidinosuccinic acid, and methylguanidine, are substantially elevated in uremic patients.80 Interestingly, these high toxin concentrations (up to 10-fold higher in CKD patients than in controls) were found in brain regions that play a determinant role in cognition, such as the thalamus, the mammillary bodies, and the cerebral cortex.80 It is well known that these uremic guanidine compounds are neuroexcitatory agents and have convulsant activity in animal studies.81 However, it is still not clear whether uremic toxins are directly responsible for cognitive impairment. The involvement of guanidines in cognitive disorders could also be indirect because it has been shown that these compounds favor an elevation of serum homocysteine.82 Lastly, Yaffe et al. showed that community-resident elderly individuals with elevated levels of cystatin-C (an inhibitor of cysteine proteases that co-localizes with β-amyloid in the brain of patients with Alzheimer disease) had lower cognitive test scores and were more likely to experience a decline in cognitive function during a 7-year follow-up period—even after adjustment for vascular risk factors.83 Despite the absence of brain MRI data, it is possible that cystatin-C has a direct effect on the risk of developing Alzheimer disease. The pathophysiologic link between brain and kidney injury is strong and complex. The cognitive disorders observed in CKD patients are probably explained by the common susceptibility of brain tissue to vascular injury. Brain MRI should be systematically performed in CKD patients with cognitive impairment because the frequency of both clinically apparent and silent cerebrovascular lesions is strikingly increased compared with that in the general population. In addition to cerebrovascular causes, other potential mechanisms, such as direct neuronal toxicity of the uremic state, could also be involved in CKD patients with cognitive disorders, especially in the absence of obvious cerebrovascular disease. Understanding the pathophysiologic interactions between renal impairment and brain function in CKD patients is important in order to minimize the risk for future cognitive impairment. Attempt to reach this goal would benefit from collaboration between neurologists and nephrologists. Collins AJ, Kasiske B, Herzog C, Chavers B, Foley R, Gilbertson D, Grimm R, Liu J, Louis T, Manning W, McBean M, Murray A, St Peter W, Xue J, Fan Q, Guo H, Li Q, Li S, Qiu Y, Roberts T, Skeans M, Snyder J, Solid C, Wang C, Weinhandl E, Zhang R, Arko C, Chen SC, Dalleska F, Daniels F, Dunning S, Ebben J, Frazier E, Hanzlik C, Johnson R, Sheets D, Wang X, Forrest B, Berrini D, Constantini E, Everson S, Eggers P, Agodoa L: Excerpts from the United States Renal Data System 2006 annual data report. Am J Kidney Dis 49: A6–7, S1–296, 2007.